Ministry of Propaganda - 20/May/2006: "Joyrider or Accident?" A burned out lawnmower (the mini tractor type version, not sure what they're called). I have no idea how it got there, only thing I know is that it wasn't there on Wednesday morning. So far I haven't seen anything on the Wiltshire Police News, at least nothing showed up in their RSS feed. 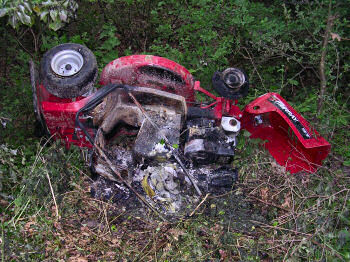 Was it stolen by someone who thought joyriding with a tractor lawnmower was fun? Or did it malfunction when a worker was driving it along the path?